The three week graduation festival known as “Schoolies” Week is fast approaching and as school leavers around the country make plans about how they will be spending it, it is also crucial that we take into consideration safety and the importance of being responsible while we’re enjoying ourselves. 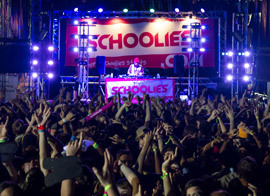 According to popular schoolies website Schoolies.com while The Gold Coast is Oz’s most popular schoolie destination, there are a number of other destinations such as Byron Bay and Airlie Beach that also draw a large schoolie crowd. Each destination has a number of exciting activities to offer but one thing that school leavers at all destinations have in common is the temptation to drink and not just drink but drink to get drunk. For most young people this holiday is their first without their parents and after so many years of schooling most school leavers just want to experiment and let down their hair. Unfortunately while most schoolies do the right thing when it comes to drinking responsibly there are many who don’t know how to handle peer pressure and their new found freedom. What is supposed to be a school leavers best week can soon turn into a nightmare because of excessive drinking. School leavers as well as parents should be responsible when it comes to consuming and providing alcohol to teenagers, especially keeping mind that excessive alcohol consumption can have some extreme negative consequences, both immediate effects as well as in the long term. Alcohol poisoning, getting involved in drunken brawls and drink driving crashes are just a few of the consequences that can result from abuse of alcohol particularly for inexperienced, often naive school leavers, most of whom probably haven’t even touched alcohol before. Parents, also keep in mind that providing alcohol to your kids is illegal if they are under 18 – the legal drinking age in Oz. By consenting to your underage children consuming alcohol, an act you may consider harmless, you are actually consenting to the law being broken. For schoolies who are of the legal drinking age, moderation still needs to be exercised – just because you can drink legally doesn’t mean you need to do so excessively. And if you are going to be serving alcohol to other schoolies, you also need to ensure that you check their IDs to confirm that they are old enough to have a drink. Speaking of serving alcohol, if you are going to be working in hospitality over the festive season, then in order to learn all the other requirements for responsible service of alcohol, you need to complete Responsible Service of Alcohol (RSA) training. In fact working in the hospitality sector, even just part time means that you need to be in possession of a RSA certificate according to the law, to learn the dos and don’ts of serving alcohol. Completing the RSA course online is an easy, convenient and comprehensive option, preferred by most servers, particularly other schoolies who have just completed many years of school and prefer online RSA training rather than having to return to a classroom environment. And at just $45 it’s a lot less costly too! The online option is also quicker and you won’t get bored…, Start course here! This entry was posted in Blog, rsa course online. Bookmark the permalink.